The novelist, essayist, and poet, Wendell Berry said he once knew a barber who refused to give a discount to balding men because his artistry was not in cutting off hair but rather in knowing when to stop. Likewise, I pray there is some artistry or at least craftiness in knowing when to begin. After much coaxing from several members of our diocesan staff I have finally committed to sitting down before this computer to write a blog. In doing so I’ve been told I need to give the blog a name. So here it is: I christen thee, Midge-buzzings, Musterings, and Musings—a name which clearly merits a brief explanation, not merely for the obscurities embedded therein, but because of what such a name suggests about the content. Since eventually, as our Lord repeatedly taught, the last will be first, I shall begin there. That is with Musings. This of course, is a rather obvious category implying— “ponderings, reflections and meditations”—thus I shall at times share with my readers thoughts and ideas far less formal than a bishop’s address, pastoral letter, or diocesan communication which would ordinarily find no opportunity for broader communication about things I find interesting. A window by Louis Comfort Tiffany, a book I’m reading, a hike I’ve taken or an entry from my personal journal. Musterings, I confess is a word I’ve tortured into being. Muster is a verb meaning “to assemble, as troops; to gather together, as, to muster all one’s resources.” Muster is also a noun—“an assembly of troops, for review or active service.” Thus, “musterings” as I’ve coined the word here means an assembling or marshalling of words for a purpose, as when Winston Churchill during the Second World War mustered the English language and sent it into battle. His speeches might well be referred to as musterings, invaluable as they were for the Battle of Britain. So in less significant and surely less eloquent ways, I hope the musterings on this blog will occasionally inspire or call God’s people to action for Christ’s Kingdom, or to engage some challenge we face in the church or the culture. Then, there are those writings best filed under the rubric of Midge-buzzings. I first came across this word in the title of a book by Ann Williams, a nature writer from the San Joaquin Valley in California, that place where I was born and raised, and can never leave no matter where I go. Ann says she got the word midgebuzzing from a curious exchange in Felix Salten’s novel, Bambi (1929). 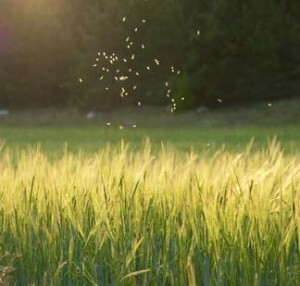 Clearly the buzzing of midges can be rather irritating and may at times even presage a not as yet felt sting or bite. Nevertheless, I’ve learned on more than one occasion while hiking or canoeing that such irritations can also awaken one from reveries and day dreams that may cause you to miss your trail junction or overlook some cairn or tributary without which you might soon be lost or worse. Nobody much likes the buzzing of no-see-ums, black gnats, mosquitoes, or deer flies but they are as much a part of life for every lover of nature and hiker of trails as trials are for every Christian, as indeed, The Letter of James tells us — going even so far as to admonish us to count it all as joy. So there may well be times I will write something here that you find as irritating and distracting as the buzzing of a horse-fly and with just as much bite and sting. Swat at if you must, dismiss it you may, but such midge-buzzing might keep you from missing a fork in life’s trail or a false channel or oxbow in the black water rivers of the culture that could get you lost for hours or even days and to recover from which may take a lifetime. Frankly, I might just have some long overdue fun with this…. This entry was posted in Uncategorized and tagged and Musings, midge-buzzings, Musterings. Bookmark the permalink. Bishop Lawrence, thank you so much for your first two posts. I will be looking forward to each of your future ones. May God continue to bless you and us as we travel this road together! I appreciate all who have taken the time to read this first blog entry and am grateful for these comments and encouragement. Thank you! If you find out what Salten’s auf Deutsch of midge-bussings was, I’d love to know! I am so glad you are going to take the time to do this blog. I look forward to every entry. Thanks! I, also, look forward to checking into your blog, Bishop Lawrence. I hope you will begin with Musings before you continue with Musterings and Midge-buzzings — just to break us in gently! Having once created and written for years a weekly local newspaper yclept “Museum Musings”, it is only fair for me to congratulate you, +Mark, on your choice of blog name! Having also had the privilege of once clasping your hand in our Lord’s name when our rector graduated from TSM (our Ky parish is under the wise and compassionate leadership of +Bill Atwood), being a close and fascinated follower of your and the DioSC’s recent tribulations, via Titus 1, 9 and the Curmudgeon, I certainly look forward to visiting your blog! In His Name, Lou B.
I look forward to your musings ! Looking forward to your posts Bishop Lawrence! Welcome to the bloggerland. Happy to subscribe to your muttering as well as musing. I look forward to reading more from you Bishop Lawrence. I, being from California, also, have it in my blood. I don’t think I want to move back to where I grew up, but somewhere other than 40 miles north of Sacramento might be quite nice. Maybe around Redding and Bethel Church.